I used to work at the Santa Fe Farmers' Market and got to know the vendors by serving them coffee. On those cold early mornings, being the one with the warm brew makes you a likely friend. After building relationships with many farms, I started volunteering at a handful to learn more about agriculture in my home landscape. I'd worked on many farms abroad when I spent years traveling in my late teens and early twenties and volunteering through WWOOF (Willing Workers On Organic Farms) in India, Australia, New Zealand, Hawaii, Spain, and Italy. I traded my farm labor for food and accommodations ranging from treehouses and tents to beds in farmers' homes, which were once their children's. 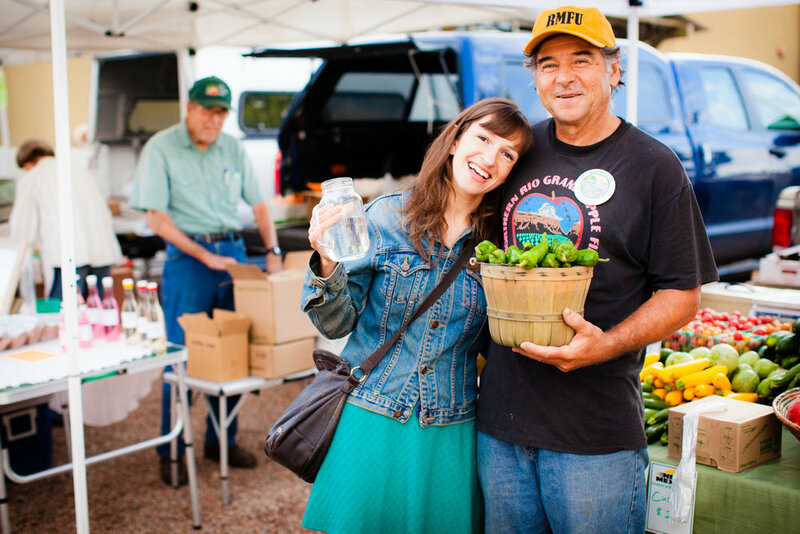 Upon my return to New Mexico, I was eager to engage in agriculture here, and have always had a deep love for the Farmers' Market since I was a little girl and would hop in the back of Jake-the-Melon-Guy's truck to choose a melon. In 2010, a local nonprofit asked me to pilot their farm-to-restaurant program because I was close with many of the farmers and could help connect them to chefs — a bridge that badly needed to be built. The first year of the program was a success, and over the next five years it became my baby that I nourished into toddlerhood under the umbrella of a few different nonprofit organizations so that we could raise funds to support my work in educating chefs and the public about the benefits of using local food. In 2015, I was ready to stand on my own and really test the market to see if this local food business could survive as a part of our food economy without grant support. That's when Squash Blossom was born. I incorporated as a social enterprise, a mission-driven for-profit entity. Squash Blossom's mission is to provide a dependable income stream for local farmers, bring healthier food to our community, and strengthen our local economy. With Squash Blossom, I expanded the reach beyond chefs and launched an online sales platform that anyone can shop from. The store is composed of 100% local food, and everything is harvested per order from more than 25 farms in the area. Q: Who has been your inspiration? The farmers are my inspiration. That's an easy question to answer. They are the hardest working, most modest, generous, and kind people that I've had the privilege of working for. I'm constantly motivated to do my work because I am so moved by the way they patiently tend their crops and listen to the Earth. The enormous risks they take each year are humbling: They face unpredictable weather patterns, drought, predators, and disease. Still, I don't think most of them would want to do anything else. Once farming is in their blood, that's what they know they're here for, and I feel the same way — I will work my whole life to support them in any way I can. I am so inspired by their stewardship that it's just a natural reaction to fight for them, sing their praises, explain to the community their value, and build bridges logistically to ensure they have markets for their goods. I do all the sales, marketing, bookkeeping, and distribution of their farm products through Squash Blossom. Q: As a child, do you remember food being an important part of your upbringing? "My mom always had a big vegetable garden." That's a sentence that I've heard a lot of people say. While farming is often thought of as men's work, being so hard physically, much of our agricultural practices and wisdom has been passed down through our mothers and grandmothers. My mom taught me to love dirt and worms and be more comfortable outside than in. I saw how things grew. It wasn't a mystery of the supermarket. Q: What has been the most difficult part of the process? I don't think of myself as an entrepreneur, though in recent years I've launched more than one business! The things I do are in direct response to needs that I care about filling. Along with Squash Blossom, I have a small handmade skincare line, Nina Botanica. I make high-quality bath and body products in small batches, using local and organic ingredients, that I sell at the farmers' market and to a couple retailers around town. This started because I needed gentle, safe, and ethically made products for my own body, and it grew because others need that too! The most difficult part of the process is believing in myself that I have what it takes to do this important work. I try and get out of my way so that the work can flow through. When I think too hard about it, I doubt myself big time. Q: Are there struggles that you see with the farms that you work with that you want to help change? Of course. Farming is full of struggle. Land is less and less accessible to farmers, especially near any lucrative market — which makes new farms very challenging to start. The median age of farmers in New Mexico is around 60! It's hard work, the hardest, so many younger generations don't want to pick up the torch from their parents, even if they do inherit land. In New Mexico, water will always be a precarious resource, and the most crucial. There are a million challenges when it comes to farming. Squash Blossom can provide a reliable income stream for farmers so that they can spend more of their time and resources addressing those issues. They are the experts at protecting against hail, late frosts, squash bugs. If they grow it, I will sell it. I hope this will encourage more farmers to keep farming, knowing that there is a stable market out there and that our community values what they do. Q: You play such an important part in the delivery of local, healthy food to people; what is it that has inspired you to start or keep doing such important work? The produce is so good, there's no denying its vitality, beauty, flavor. I show up with it at restaurant kitchen doors, and the line cooks are delighted to see me. This is the real stuff that was in the ground only hours prior, unlike most of the other ingredients they receive. They know exactly where it comes from, usually from land they have a direct connection to, which gives them a sense of pride and joy in receiving it. I am passionate about preserving traditional farming practices, protecting the land, bringing healthy food to my community, and strengthening our local economy — plus, it just feels good to be around so much life! The colors, smells, and vibration of this food are as good as it gets, and I get to hang out with it all day, every day! Q: Do you have advice you'd like to share that you have learned along the way? Be tenacious. Don't give up. Doing anything is brave, and there will be doubts both internal and external — but just get back up when you get knocked down and remember why you wanted to do your thing in the first place. Your integrity and happiness is an inside job. Get clear with you and let that hold you when things get rough. Growing Peas for Squash Blossom at Española Valley Farm. Image by Genevieve Russell. Nina is the founder of Squash Blossom Local Food, a social enterprise serving farmers of and around Northern New Mexico, distributing their produce to restaurants and to the general public in Santa Fe. Nina has worked in food and farming both in her home state of New Mexico and around the globe. Her experience in small-scale agriculture ranges from growing to distribution, managing and vending at farmers' markets, and years in the nonprofit sector. Nina's passion is to make small-scale, family farming viable for generations to come. She sees the work of Squash Blossom as a way to protect the earth, preserve culture and diversity, strengthen the local economy, and imbue health for all eaters.